An outstanding characteristic of the early bronze-using period of Thailand is that societies were peaceful. The association between bronze production and warfare assumed by earlier scholars as characteristic of a typical “Bronze Age” is disproved by Ban Chiang archaeological evidence. This is yet another sign of the unusual nature of this site, as well as the other Southeast Asian bronze period sites, which also show no sign of widespread violence or warfare. In contrast, many—if not most—early bronze-using societies in other parts of the world used this alloy to make new and effective weapons, such as spear points, arrowheads, daggers, swords, and armor. In these cases, additional evidence points to military rather than personal use of such artifacts, such as fortifications constructed at the same time and evidence of violent trauma to human skeletons excavated from those sites. Ban Chiang has no evidence of either. Also, the appearance of bronze weapons in the archaeological record outside of Southeast Asia often correlates with clear social hierarchy and political centralization, neither of which are evident in bronze-period Ban Chiang. 1. BCES 532/1601 was found on the left wrist of a four-year-old child (BCES Burial 26). 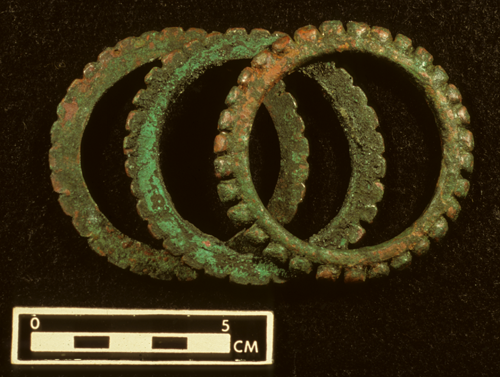 Cuff is copper-based and the outer bangles are iron. Middle Period. 2. BCES 490/1246 from the ankle of a eight-month-old child (BCES Burial 16). Middle Period. 3. BC 693A-C/1203 found on the left wrist of an adult male (BC Burial 23). Early Period. 4. BCES 495/1438 is a set of bronze coils from the lower arm of an adult female (BCES Burial 23). Middle Period. 1. BC 399A/1115 (upper object) is a lunate iron blade and BC 399B/1115 (lower object) is a straight iron blade. 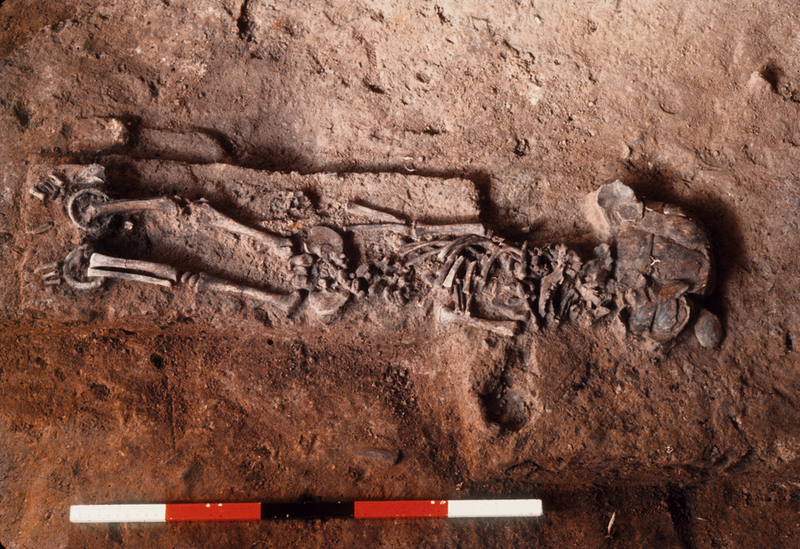 They were found in the burial of a twelve-month-old child (BCES Burial 12). Middle Period. 2. BC 694/1203 is a bronze adze found in BC Burial 23. Early Period. 3. BCES 245/543, a curved iron blade. Late Period. 4. BCES 725/2511, assorted bells (top left), BC 716/2016 (top right), BCES 162/205 (bottom left), and BCES 254/604 (bottom right) are copper-base bells. All Late Period. Analysis of more than 140 skeletons excavated at Ban Chiang showed that none of them have the distinctive signs of interpersonal violence—e.g., fractures of the lower arm, skull injuries, or arrows embedded in bone—that would indicate widespread violence or warfare.